The Hoover Institution on War, Revolution and Peace is a remarkable organization that was founded by an extraordinary individual, Herbert Hoover. Orphaned at the age of ten, at seventeen, Hoover joined four hundred students at Stanford University for inaugural ceremonies that opened the university on October 1, 1891. After graduating in Stanford's pioneer class in 1895, he would go on to become a successful mining engineer, generous benefactor, well-known humanitarian, prominent statesman, and president of the United States. In 1914, Herbert Hoover was living and working in London, England, when World War I broke out in Europe. He immediately became involved with assisting American travelers who were fleeing the war zone. With the German invasion of the neutral nation of Belgium, Hoover was asked to create a private humanitarian relief agency to assist Belgium's civilian population, which was accustomed to importing 80 percent of its food. The German occupation and the Allied naval blockade threatened famine and death by starvation to this country's citizens. During this time, Hoover read, and was influenced by, an autobiography of Andrew White, a distinguished historian, diplomat, and the first president of Cornell University. White had assembled a vast collection of documents pertaining to the French Revolution that ultimately contributed to one of the best accounts of this historic event. Hoover then realized that he was in a unique position to collect fugitive information about the Great War that was then unfolding. It was this idea and vision that would lead the Hoover Institution on War, Revolution and Peace into becoming the largest private repository of documents on twentieth-century political history. In 1917, the United States entered the war, and Hoover, by now a famous humanitarian hero, returned stateside and was appointed by President Woodrow Wilson to become head of the newly created U.S. Food Administration. When the war ended in 1918, Hoover returned to Europe for almost a year as director-general of the American Relief Administration to organize the supply and distribution of food and relief materials to more than twenty nations affecting one-third of the population of Europe, thereby facilitating the emergence of stable economies in the war-torn region. By 1920, Hoover and his family had returned to his alma mater, building a handsome house on the Stanford campus. However, in 1921, President-Elect Warren Harding recruited Hoover to become secretary of commerce. While traditionally a lowly cabinet position, the popular Hoover quickly established himself as one of the most prominent people in American public life. When President Calvin Coolidge succeeded President Harding, Herbert Hoover was asked to continue his service in the same capacity. In 1928, when President Coolidge declined to run for a second term of office, Herbert Hoover was urged to become the Republican candidate and was eventually elected as the 31st president of the United States. In his first year of office, an economic crisis ensued with the stock market crash of October 1929. The onslaught of the Great Depression led to Franklin D. Roosevelt's successful presidential campaign in 1932. Herbert Hoover and family returned to their Stanford home in 1933. In 1919, Herbert Hoover pledged $50,000 to Stanford University to support his Hoover War Collection. He was also personally responsible for most of the gifts during the early founding, as well as for decades thereafter. The collection flourished in the early years and in 1922 was renamed the Hoover War Library. While it was physically housed within the Stanford Library, the collection was kept separate. By 1926, it was legitimately described as the largest library in the world dealing with the Great War. By 1929, the library contained 1.4 million items, and physical space became an issue during the troubling times of the Great Depression. Finally, in 1938, a building plan was unveiled for Hoover Tower. 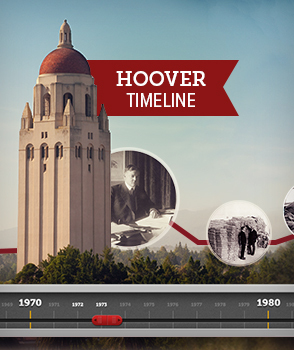 The tower, reaching a height of 285 feet, was completed in 1941--the fiftieth anniversary of Stanford University. By 1946, the agenda of the Hoover War Library had extended significantly to include research activities, and thus the organization was renamed the Hoover Institute and Library on War, Revolution and Peace. Herbert Hoover was now living in New York City and allowing his Stanford residence to be used by Stanford's president. He would later donate his home to the university for such use. Nonetheless, Hoover remained integrally involved in the Hoover Institute and Library as a significant benefactor, fund-raiser, and principal provider of guiding inspiration. Indeed, in 1956 a major funding campaign was launched, with Herbert Hoover leading the effort. The development of the enterprise was so prominent that in 1957 it was again renamed as the Hoover Institution on War, Revolution and Peace, the name it holds today. This statement, nearly four decades old, is robust, containing the essential ingredients that characterize the Hoover Institution of today. The pervading analytic demeanor present at the Institution emphasizes freedom (economic, political, individual) in the ultimate pursuit of prosperity and peaceful security, with skepticism of an ever-expanding role of government in the affairs of society. 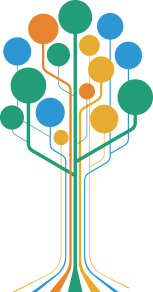 Ideas have consequences, and a free flow of competing ideas leads to an evolution of policy adoptions and associated consequences affecting the well-being of society. The Hoover Institution endeavors to be a prominent contributor of ideas having positive consequences.